If you've been following along for a while, you may have seen a few Instagram posts about a year and a half ago about a house that we sold privately, without ever putting it on the market. The buyer was one of my sorority sisters whose hubby had been following along with our current project on Insta - and when they decided it was time to move STAT, she reached out to me inquiring about the house. Long story short, she came to look at it the day after Thanksgiving, before it was even done - we had just had the kitchen and bath counters installed - they bought it and it's now home sweet home to Danielle, Drew and their three adorable kids. We couldn't be more thrilled with how everything worked out. Ok, so now that it's a year and a half later, why am I talking about this? 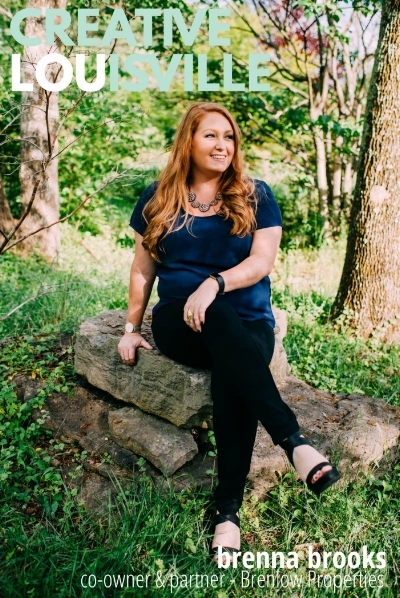 Danielle happens to be not only a total #girlboss working mom who just started her own PR company, she also runs a style blog on all things Louisville and agreed to write a feature on me! Photo by Ashley Glass Photography. Full image via Lou What Wear. * You and your Dad work together on your projects, what is it like working together? Working together has been very rewarding. We actually have very similar tastes and viewpoints when it comes to how we want to renovate/get to the finished product, so we almost always agree on decisions/approaches to take. Obviously working with my dad means that I get to spend a lot of time with him, and I’ve learned so much over the past 4 years that I likely wouldn’t have learned otherwise – mostly from doing all of the work on the first house ourselves, ha! * What do you look for in a property? The top three rules in real estate are location, location, location – and I think that’s definitely true. We are so careful to buy houses in desirable locations, and pay attention to what’s around it as well – we’ve walked away from more than a few properties because they were surrounded by apartment buildings, for example; or if they were too close to a busy main road. Besides that, we look for the ability to create a home that is desirable to end buyers – can we open it up to be a mostly open concept space? Are there at least 1.5-2 bathrooms? (properties with only one bath are much harder to sell in almost all areas.) Is there a decent yard space for kids and pets to play? Since we are investors, the end goal is to sell it – so we have to be able to attract the most potential buyers, for a quick sale. Evaluating what the buyers want, vs. judging it on our own personal taste, is the most important factor and something we remind ourselves of constantly. * What is your favorite part of the renovation process? I think my favorite day during a renovation is cabinet install day. That’s when things really start to come together, and the “vision” starts to turn into reality. It’s amazing seeing all of the different design elements I have picked out actually put together in the space, instead of just one thing at a time in different showrooms or websites. I also really love looking back at the “before” pictures once we’ve completed a project, and seeing how far the house has come. Lastly, hearing all of the support and positive feedback from the neighbors is super rewarding – we do this because we love this city, and hearing that the neighbors appreciate our work makes us feel good about the work that we do. Everyone needs a little positive affirmation every now and then! Danielle also asked me questions about why I'm a lifelong Louisvillian, how we got into this crazy world of flipping houses, and what's next for Brenlow Properties. Read the full interview on Lou What Wear. I seriously can't thank Danielle enough for this feature. If you're looking for a daily dose of hilarious real talk with some #momlife, style and shopping tips, and Louisville love thrown in, you can follow her on Instagram or Facebook.